Our Year End Donor Report – Thank you for your Support! 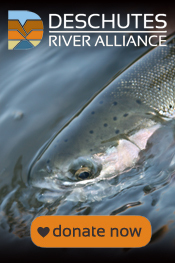 The Deschutes River Alliance is pleased to announce the publication of our first Year End Donor Report. One purpose of the Year End Report is to note our accomplishments since our inception in August 2013, particularly highlighting our 2014 Science Investigation and Work Plan. The main purpose is to recognize our donors who generously supported the DRA in our first year. The Report also has a message from DRA Board President Greg McMillan, a description of the scientific foundation for the DRA, our major accomplishments, a summary of our objectives for 2015, and a 2014 financial summary. There is also a list of DRA donors who contributed to our work in 2013 and 2014 (through early November). We are extremely grateful for your support in our first year of existence. Since the publication of this Year End Report, the DRA has received additional support from many individuals whose names may not be on the Report, but are found on our website here. If you have not donated before, now is a perfect time to support the DRA and our 2015 Science and Advocacy Work! This is also the final few weeks to join the Founding Circle. The Founding Circle will be a permanent recognition of DRA supporters who donate $1,000 or more before January 1st. Again, thank you for your support and best wishes for a healthy and productive 2015.